Poll: What kind of flooring do you have in your workshop? I like a clean garage. I was cleaning my garage yesterday. After two years. It’s not that it didn’t need to be cleaned before then, I just didn’t have time to get to it. My usual routine is to clean after every project, before starting another. I rarely clean while a project is in progress, no matter how long the project or how slow the progress. These days, spending hours upon hours in the shop takes a toll. After two decades of controlling plantar fasciitis with prescription orthotics and being completely pain free, that all changed a few months ago. I’ve been visiting my podiatrist and doing the exercises he gave me, but I’m not back to where I was. As if that weren’t enough, I’ve developed a bum left knee. When I clean, there is a lot of walking involved, as I’ll pick up one or more items that are out of place and move it/them to the correct location. That adds up to a lot of walking in a day, even before I start the tedious task of vacuuming. Compare that to a typical day at work. We open at 8. We close at 7. Although I spend the middle of the day running errands, eating, writing and studying, most of the rest of the day I’m on my feet. And, I rarely have significant pain at the end of a day in the clinic. The difference? Construction, I believe. Even though our home is built on three levels and sits on pilings, the garage has a concrete slab floor. Concrete is stable and durable, but it can be hard on the feet and legs. 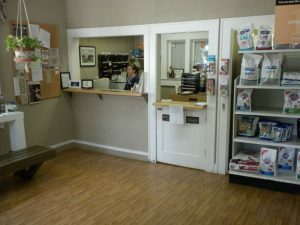 The clinic, a 150-year-old former dwelling, is built like most homes of the era: wooden frame sitting on piers, about 1-1⁄2 feet off the ground with a wood floor. The amount of give this type of floor has makes, I think, a huge difference in one’s ability to be on their feet for an extended period of time. This building may be old, but it’s very comfortable to work in. To say nothing of homey. Of course, there are many brands and styles of pads that can be put on a concrete floor to make it kinder to one’s feet and legs. I have also considered installing a false floor with 2 x 4 stringers and plywood for more give. However, that would be very involved. What about you? What kind of floor does your shop have? Tell us in the comments why you like or dislike your floor. 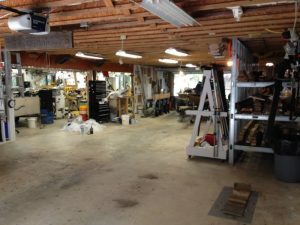 To see more of Jim’s shop, click here to see view our September 2018 Show Us Your Workshop in Wood News Online. I bought 4’x7′ rubber mats at the ranch supply store, I think made from ground up tires. They are fantastic on my feet and legs and also great if I inadvertently drop a tool. Weren’t that expensive either. I have a concrete floor, covered with rubber tiles from the home center. They have a rough surface and catch a lot of dust. But they are easier on the feet than bare concrete. I recall a relatively long conversation with a podiatrist in my early 20s in the early 1990s. He talked at great length about concrete slabs vs the traditional shallow crawl space and the difference on your feet. Of course, being in my early 20s, nothing hurt and I couldnt appreciate it at the time. I did however keep it in mind when I bought a home and made sure I got one with the shallow crawl space. Sadly, I work in the garage which is a concrete slab and is hard on my feet now that I am 50. Anti fatigue mat helps a little. I have considered building a 200ish square foot shed out back (with AC) so I could get something easier on my feet. Doing hand tool work, that is more than enough space. Someday, I may convert one of the bedrooms into a workshop. I’ve got a concrete floor but would like to have something easier on the feet and easier to keep clean. In my previous shop I placed wood laminate over concrete. Provided just the right amount of cushioning and things rolled very easily on the surface. This is going to sound crazy, but I took a big piece of high-end carpet that I tore out during a remodeling job and laid it on the floor of my shop, directly on the concrete with no pad. I cut out for all the stationary machines, and it works well at doing a couple of things. One is that it absorbs sound from running machinery. Another is that, of course, it is much easier on the feet and legs compared to the bare concrete that was exposed before. Finally, it isolates my feet from the cold slab – an important consideration here in mid-Michigan. If you don’t want to go full-bore with carpeting an entire shop, It can make sense to cut strips or rug-sized pieces of carpet to lay down on concrete in front of an often-used bench or stationary machine like the tablesaw or bandsaw. One of the best parts is that you can pick up used, good-qualtiy carpet for nothing at a carpet installation shop. They’ll be happy to give you as much as you want. As a long time woodworker and renovation contractor and one who has worked on many different floors, I can say with considerable confidence that there is nothing better than a nice warm wooden floor. Preferably hardwood, though strip Douglas fir is nice. Concrete slab on grade, as in a garage, is the worst. They are cold, wet and hard all of which are unfriendly to people, tools, machinery and wood. I have worked on many. It can be made somewhat better by covering a concrete floor with a moisture barrier, insulation, wooden sleepers and plywood sub floor that can be used as a finished floor as a base for a proper wood floor. Your feet, knees and back will thank you as you age. Hello Jim. I also have a concrete floor in my shop which now that I am older was taking a toll on my legs and knees. My shop is in the third stall of our garage. Besides wanting a more comfortable floor I was looking for insulation valve as I live in a cold climate. I was going to use furring strips with Styrofoam between the strips, but that would leave me with a 3/4″ to 1″ transition between the other stalls. I sometimes roll machinery between the two. I contacted a large flooring supply company and explained my situation to them, wanting insulation valve and also some cushioning effect for my feet. They recommended a Vinyl snap together floor laid on top of a wool mat with a reflective aluminum backing. The backing goes down on the concrete to reflect the cold down. I’ve had this floor for about 4 years now and I do like it. It can take the weight of the machines rolling across it without denting. It does add a cushioning effect when standing on it. I’ve had many compliments on the looks of the floor and people tell me they can feel the comfort of the floor. There is no perfect material for a shop floor. Two minor draw backs are, with sawdust on it, it is a little more slippery but good shoes will compensate for that. The other is static electricity, I’ve had to ground my dust collect hoses to whatever machine I am using but I should have been doing that anyway. Look into it, it works for my shop. I have a bandsaw, router table and chop saw that need dust management. Most of my work is with hand tools so most rubbish s shavings rather than dust. Having developed the habit of a quick vacuum at end of day, the carpet has been easy to keep clean. Not danger of tripping on mats etc. Carpet is much easier under foot than concrete was and also provides a little insulation. Pleased with choice. I bought a roll of 1/4” dimpled plastic underpayment. The flat surface sits 1/4” above my concrete floor and the 1/4” of air space under allows air to circulate under the plastic and gives you some space if you should ever get some moisture under there. I put tongue and groove OSB over the plastic and sealed it with some polyurethane. It’s way better than concrete. I have 1″ commercial/industrial rubber floor matts/runners on the major workstations and 2’x2′ interlocking floor matts on 80% of a 30’x 35′ work area these are installed over 1 1/2″ x 6 tongue and groove treated lumber. great on the feet /legs and easy to clean. I laid 12″x12″ vinyl tile over concrete, mainly to prevent moisture from wicking up or down from wood that I may set on the floor.The tile is a neutral white which adds to the brightness of the room and also helps me quickly find small things that fall when I get clumsy. There are two 2’x4′ rubber pads on the floor working side of the woodturning lathe where I spend most of my time. I have rubber mats around fixed machines I spend a lot of time at. Radiant heat in concrete. Yes, concrete is very hard on feet and knees (70 plus birthdays), but the warmth seems to take some of the sting away. I paneled dri-core squares to cover a cement pad and brown epoxy-paint over the top to combat some moisture issues that can’t be fixed without replacing the pad. It worked out better than I expected and I’m quite happy with the floor. I have considered recycling pallets to make a wood floor in my 3rd bay/work area. I think the give would be great on the legs and feet. I had great luck with Celebrex for my plantar faciitis. Advil would help, but not enough. 48 hours after my first dose of Celebrex, no pain.Good luck!